Here at Food52, we love recipes -- but do we always use them? Of course not. Because once you realize you don't always need a recipe, you'll make your favorite dishes a lot more often. Today: There are snacks hiding inside your pumpkin. 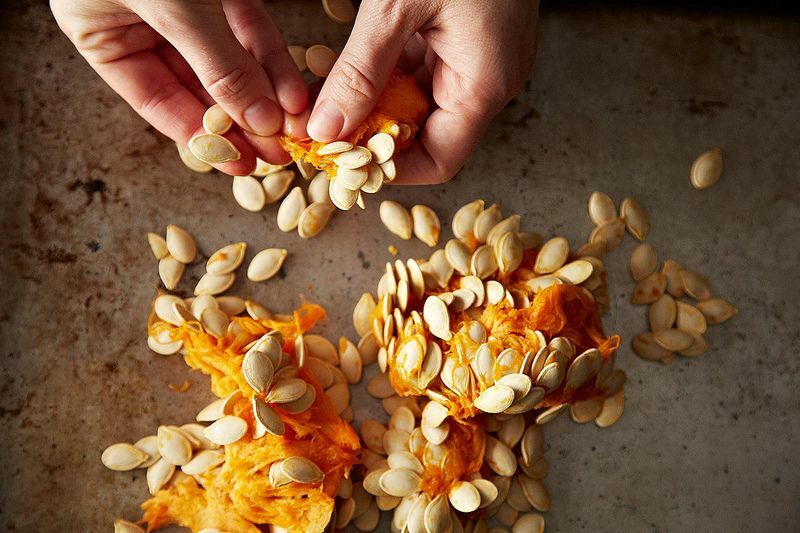 Here's how to roast any squash seed, without burning -- and without a recipe. If you're carving or roasting any pumpkins this fall, you'll have some guts to deal with. From the depths of your gourd you'll scrape out a tangle of orange pulp dotted with small white seeds, and if you're smart, you'll do something with it. Take a few minutes to separate seeds from slime, and you'll have a free snack to enjoy while you carve or roast. 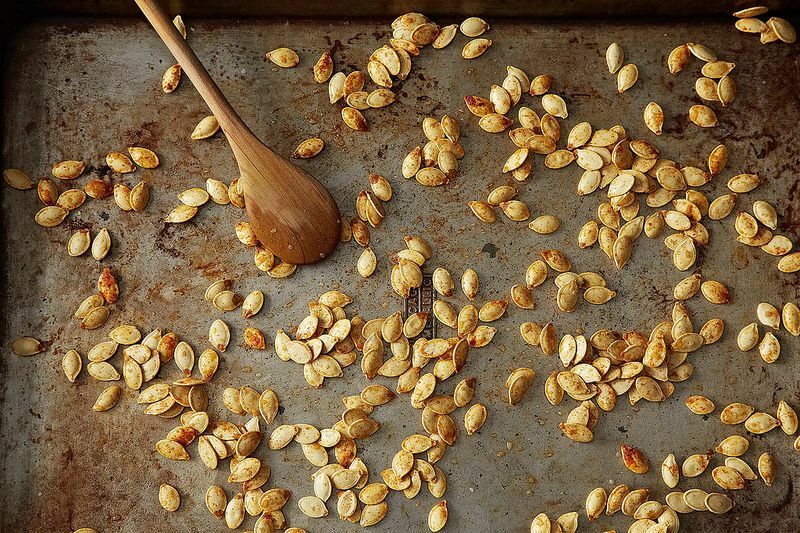 Roasted pumpkin seeds are the BOGO of autumnal treats. More: Roasted seeds also serve as a welcome textural contrast in recipe-less quinoa salads. You don't need a recipe to do this, but you do need to pay attention to your technique. These seeds are tiny, and negligence will lead to burning. 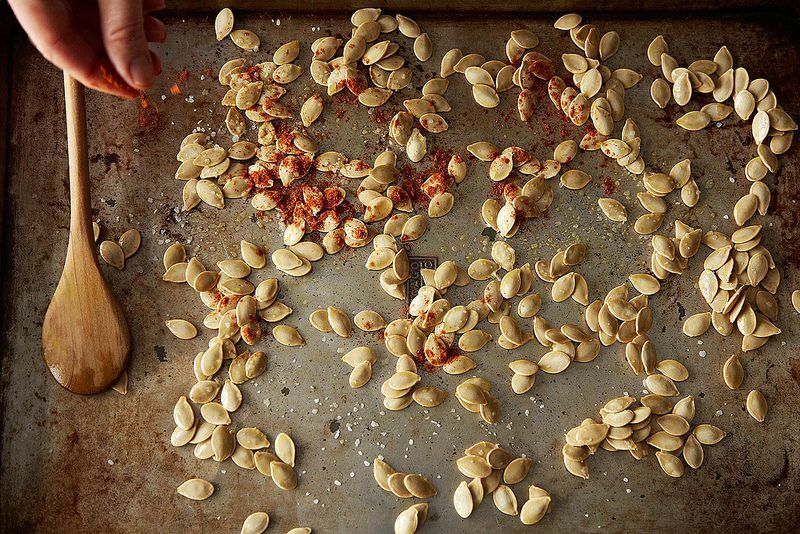 Follow these five steps and you'll end up with crispy, crunchy, salty seeds. Then start experimenting with flavors and other squash seeds: butternut, acorn, and delicata are all fair game. 1. Separate your seeds from their flesh. Start by squeezing the big pieces of flesh right at the seam where the seeds attach, and they'll fall off in clumps. Pick out any remaining stringy stuff. Prepare for your hands to get a little orange and a lot slimy. Keep a towel nearby for wiping. 2. Rinse, then boil your seeds. Why boil? The tricky thing about roasting pumpkin seeds is that their insides tend to cook faster than their outsides, so when they look done they're actually black inside. 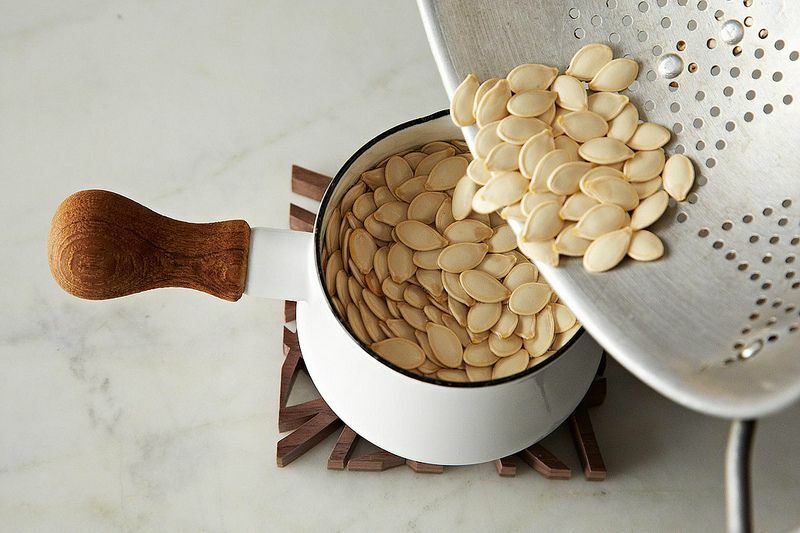 As we learned from Angela Liddon, boiling pumpkin seeds before roasting ensures that everything cooks evenly. So after you've cleaned the muck off of your seeds, boil them in salted water for ten minutes. More: We're selling this adorable pot in Provisions, and it's the perfect size for seed-boiling. 3. Dry thoroughly. You're about to toss these puppies with oil -- and you want it to stick. 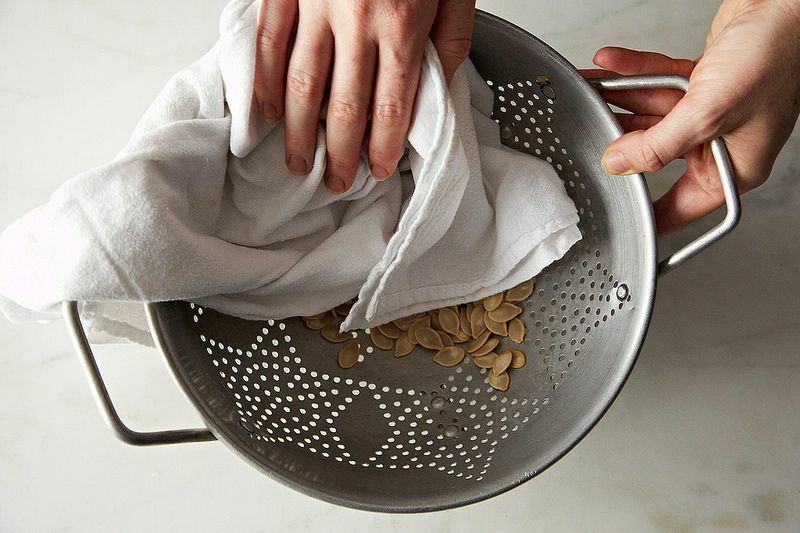 So dry them well, dabbing with a clean tea towel in a colander until they're dry. Pluck off the seeds that cling to your towel. 4. Toss with olive oil, salt, and spices. Here, we used a mix of paprika, cumin, and cayenne pepper. Try curry powder with melted coconut oil, or pumpkin pie spices for a salty-sweet autumnal snack. 5. Roast for 10 to 12 minutes at 325° F, stirring halfway through. Your seeds are done when crispy on the outside and golden on the inside. Add more salt to taste as necessary, and serve once they're cool enough to eat. You can also store them in an airtight container and use them throughout the week as a topping for sides, salads, oatmeal, or yogurt. As for pumpkin carving tips, well, we've got those too. First time boiling the seeds prior to roasting and it works perfectly. I let them dry on a dishcloth after they had been boiled for about an hour, then roasted them at 350 for roughly 45 min (checked every 8 min to mix around on the baking sheet). Used EVO+s&p+a pinch of garlic powder. I am so addicted to roasted pumpkin seeds! I make sure that everyone I know who carves pumpkins but tosses the seeds, set them aside and I will make my rounds, collect all said bags and then it's on. I have never heard of parboiling the seedage until I found this web page and I am very thankful and excited. Me and my twin brother grew up eating my mom's roasted seeds, shell and all. I have never known any other way. Who the F would sit there for hours on end, separating seed from shell? I would end up murdering someone ;-) my go to recipe is XtraVirginalOliveOyl, garlic pow, pepper and a shitload of salt. I have over cooked too many batches in the past so now I usually cook the seeds at low temps for hours, stirring every half hour. This parboiling techniques couldn't have come at a better time because stirring seeds every half hour for hours on end is tedious and time consuming. I'm about to try my first batch of butternut squash seeds. Did anyone has tips or suggestions please respond and wish me luck! With hokkaido seeds, I've had the same experience as marcellem, it takes about 25 minutes. The butternut squash seeds didn't need more than 12 minutes. So 12 minutes at 325 is really optimistic. I'm going on 30 minutes now. I tried this method and roasting them without parboiling. In both cases the seed sticks to the shell. What went wrong? I just eat the shell—problem solved! my first attempt at roasting a kabocha squash and so glad I found this! I loved this method of pre-boiling. I've always found the shells a bit tough, and this time the end result was light and crisp. I used butternut seeds and our local Martha's Vineyard Sea Salt (yum)--had to roast a few minutes longer to get to golden brown, but no big deal. Thank you! This IS a recipe. I still don't know how to do them without one. I hated pumpkin seeds before I read this. My honey love love loves them and asked me to make him some. I told him about your method and melody to making them and he said, " Please don't do it that way." He prescribed not washing them. Yes, don't wash them. It's takes out the natural oils that help the seed gain crunchiness when cooked. Just roast at -350 with some light salt, a few turns and their perfect. I'm putting them on everything now. Simple - Easy. I use Dawn because it also gets grease stains off of clothes if you use it as a pre-wash. You may need a combination of dish soap, baking soda, and (I also swear by) Barkeepers Friend-which helps get the "bluing" off my stainless pans, and a "scrubbie". Maybe even soak with dish soap and baking soda, hot water beforehand. I have a random totally unrelated question--I have the same pans as the photo and I was wondering how people clean them. Mine look awful now with burned oil baked into them. I've tried baking soda but it hasn't helped much. And then once I used a much harsher cleaner/degreaser and that was worse, it rubbed off some of the finish. Forgive my naivete, but do you eat the shells, too? I've always roasted (without the pre-boil) and then eaten them like sunflower seeds...insides only. Enlighten me! I was in your boat before my roommate started taking my seeds and roasting them, but he didn't boil them. Then, I some googling and found out, thankfully, that the shells are much easier to chew when pre-boiled. We've never removed the shells-we always ate the whole thing. They're not indigestible-they're great! Just make sure they're cooked to the color in the picture-but if I overcook them I eat them anyway. I'm almost 60 and I've enjoyed them this way ever since I was little. I pre-boil mine in generously salted water, then drain and pour onto a backing sheet. After roasting, the seeds are salty and don't have any added fat from the oil. I do the boiling when I roast... I add water to my roasting pan together with water, salt and other spices. The boiling is key! I only recently tried it and it has made such a big difference... However, I had a heavy handed cayenne batch bc I got excited. 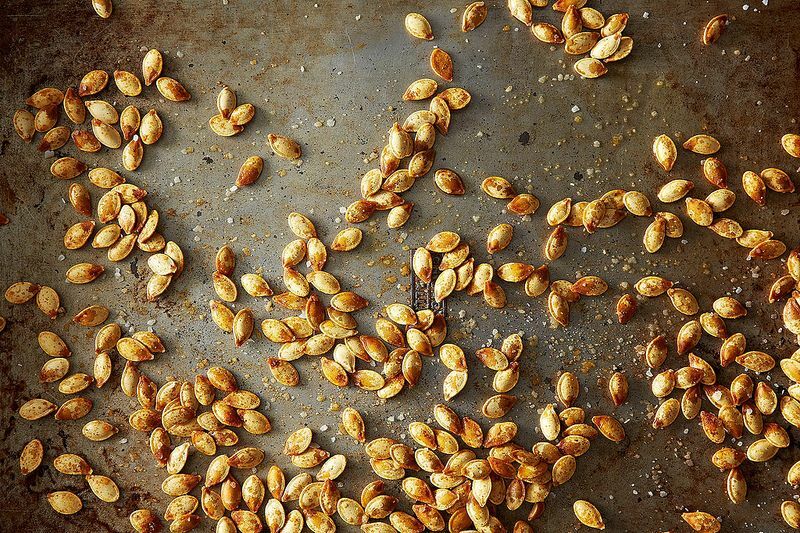 We grew up roasting pumpkin seeds with butter, salt and pepper. A few years ago I was making a version of Dorie Greenspan's stuffed pumpkin. I had overfilled it and some chicken stock, buttery goodness had escaped onto the pan that held the pumpkin, so I scattered my pumpkin seeds around the pan in the juices. The best pumpkin seeds I've made so far. With a pile of kabocha seeds in my kitchen and a previous lack of knowledge of the pre-roast boil, this could could not have come at a better time! Oh I'm so happy! I tried to carve pumpkins last night just so I could roast seeds, but my local store was all out.